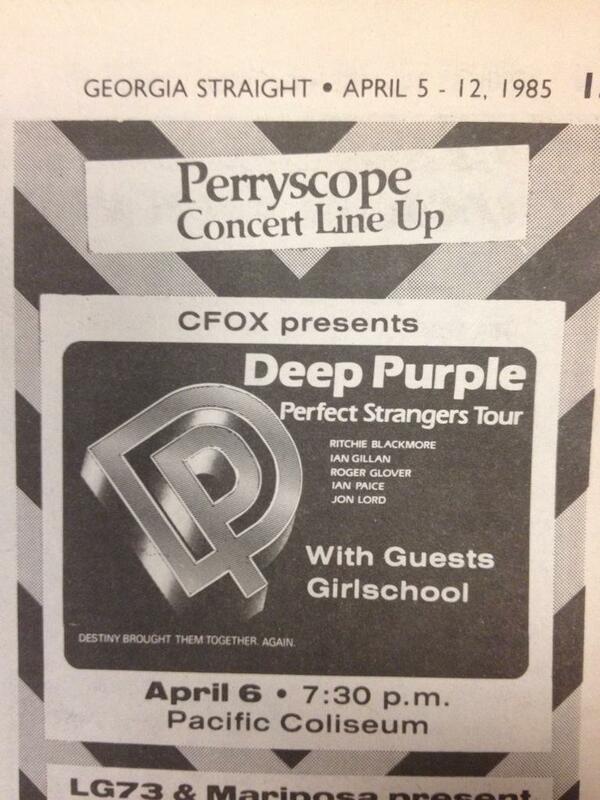 On April 6, 1985, A.D.–Deep Purple played Vancouver’s Pacific Coliseum on its Perfect Strangers tour. Obviously I went, because the year before Ritchie Blackmore and Roger Glover had reunited with Ian Gillan, Jon Lord, and Ian Paice to get the Mark II lineup back in action. Anyway, in advance of the Vancouver show I did a phone interview with Glover, who you may recall played bass on “Smoke on the Water”. He had some interesting things to say, especially about the elusive Blackmore, whose amazing guitarwork has always left me in awe. So here, for the first time ever on the Interweb, is our conversation. What prevented Deep Purple from reuniting before? I read somewhere that it was mainly Ritchie who was opposed to it. Well Ritchie and I were in the same band (Rainbow), so we were of a single mind. There’s been a lot of rumours of a reunion over the last six or seven years, but none of it really came from us. It wasn’t a quantum leap for any little brain inside an entrepreneur or agent or manager or record company to figure out that if you put us five back together again you could make a lot of money. We had been offered enormous amounts of money, but we all–for different reasons–turned it down. Because money isn’t the prime motivating force. We had a lot of money back in ’72, but it didn’t keep us happy. This time it came from within the band, from just a real desire to be together again. Rumour has it that each member was paid a million dollars to reunite. We were offered that ages ago. I remember being offered two million dollars, between the five of us, to do one concert, if you can believe that. But no, we weren’t paid a million dollars each to do it. There’s a legitimate, ordinary kind of record deal which is worth up in the millions somewhere. But that’s between the five of us, not each. So do you see the reunion as being a long term thing? Oh yes. There’s no point in doing it unless it’s long term. At least I hope it’s long term. One never really knows, especially with a band as volatile as Deep Purple. Did you have any trouble learning the old Purple songs again? Yeah. We had to get someone to go out and buy the records so we could figure out what the chord changes were. I mean “Smoke On the Water” we didn’t have much trouble with, but “Highway Star” we had pretty well forgotten. As a matter of fact, we started doing “Lazy” on this tour, and we thought we’d remembered it pretty well. But just the other day I was in a car, going to a gig, and “Lazy” came on the radio. And I realized that there were two whole verses–an integral part of the song–that we’ve been leaving out for the last three months. Not one of us had noticed! Do you remember what it was like at the first jam that you had with the reunited lineup? Yes. We’d all been out to a restaurant, and we came back around ten-thirty and just sort of wandered down to the basement. And I can’t remember who started playing first–it was just a blues jam, not a special song or anything–but we all just kinda joined in. And I do remember, within about two or three minutes of starting, looking around and seeing everyone grinning from ear to ear. I mean it was a fantastic feeling. When you and Ian Gillan first left Deep Purple, after the Who Do We Think We Are album, what did you think of your replacements, David Coverdale (now in Whitesnake) and Glenn Hughes (the Hughes/Thrall Band)? I was very resentful. 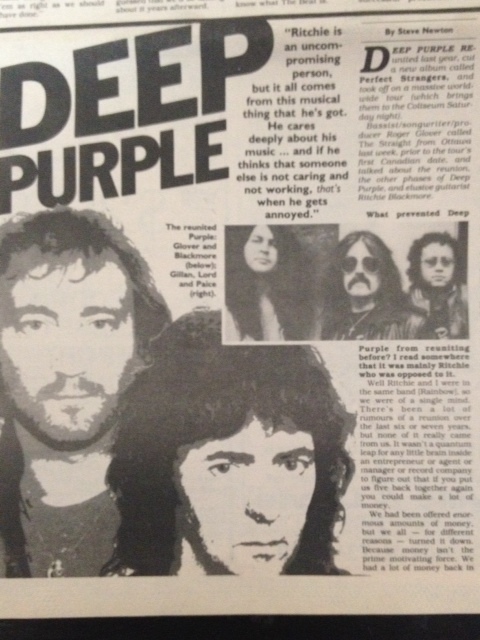 I didn’t leave Deep Purple in a nice frame of mind; it was a bitter breakup for me. And later in 1973, when we got the Billboard Award for selling more albums than anyone else–even more than Frank Sinatra or the Beatles–the new band got credit for it. So understandably I felt very, very bitter towards them. 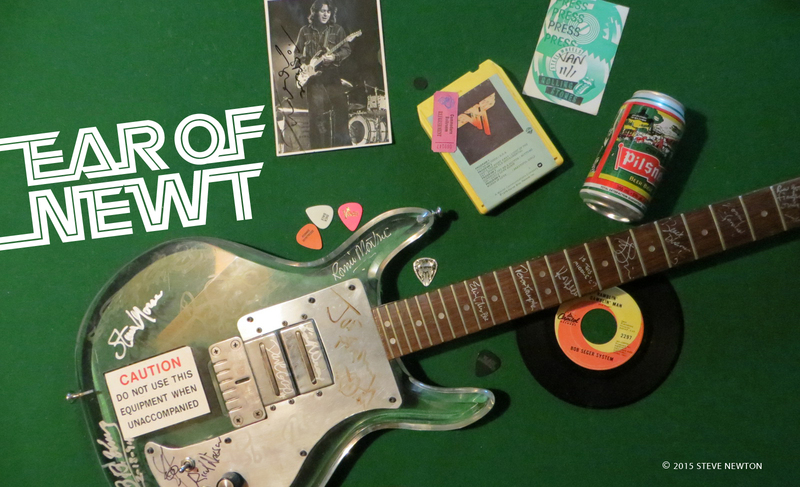 Did you ever hear Deep Purple when they had Tommy Bolin on guitar, in place of Ritchie Blackmore? Having been in Rainbow with Ritchie for so many years, have you found that he lives up to the reputation the music press has given him of being very moody and hard to deal with? Well, we’re all moody. I don’t think he’s any more moody than anyone else–it’s just that he shows it more. I find myself facing these questions a lot, and I find myself defending Ritchie because I think he comes in for some unfair attacks. At the same time, he does do things that annoy the hell out of me. Oh, things like walking off and refusing to do an encore. I’ll ask, “Why? !” and he’ll say “I don’t feel like it. The audience didn’t deserve it.” And I’ll disagree with him. I think that’s wrong. Has he done that on this tour? Yes, sometimes. Not often. I mean he’s a man who commands his own way–regardless of anyone’s feelings. That I find annoying. But then again when you talk to him about it, he’s so disarmingly honest about it that you can’t dislike him for it! So Ritchie’s an uncompromising person, but it all comes from this musical thing that he’s got. He’s an incredible talent, and he works very very hard. He cares deeply about his music. And if he thinks that someone else is not caring and not working, that’s when he gets annoyed. There’s his famous reputation about sacking Rainbow’s musicians, but no one ever got sacked for doing a good job, you know what I mean? He’s only trying to make sure that the band is always one hundred percent.